In our latest research report, we examined the social media activity of 10 leading Australian health Insurers. We measured Facebook, Twitter and LinkedIn followings, Facebook likes, and YouTube subscribers, as well as the frequency of each company’s social activity (number of tweets/retweets, number of Facebook and LinkedIn posts, as well as number of YouTube videos published). We looked at the types of content they are publishing and here's what we found. 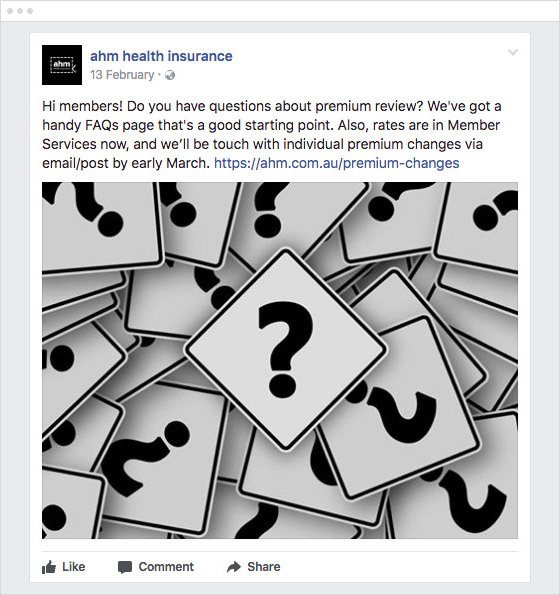 The more active Australian health insurers in this research report have on the whole found their feet in social media, especially on the more consumer friendly Facebook platform where they are posting relevant content surrounding the subject of ‘health’ to their audiences on a consistent basis. However, several brands are still reluctant to put a lot of resources into creating a robust social media content publishing program. From a content perspective, the most commonly posted content types were ‘Branded content blog links’ and ‘Sponsorship’. Most of the health insurers in this report were maintaining content blogs as part of their websites and were publishing mostly editorial articles, videos and infographics around a wide variety of subject matter that intersects with the subject of ‘health’ from tips for caring for newborn babies to recipes for healthy family dinner choices. In fact, 43% of the Facebook content posted by the 10 leading health insurers in this report were links promoting branded content blog articles. Sponsorship related content, especially sports sponsorships continue to be a popular source of content for the health insurers which is understandable considering the close association of health and sport. Facebook and Twitter were the 2 channels that had most energy dedicated to them. The more active health insurers in the report posted to Twitter an average of 3-4 times a day and to Facebook an average of nearly 2 times a day. Conversely, LinkedIn was only used lightly in terms of publishing content, with 3 of the 10 health insurers not posting any content during the 3 month period of the report. Considering Twitter tends to be a fairly low traffic driving channel (but still a very useful channel for other purposes) and that in many cases the health insurers actually have greater social reach with their LinkedIn channels than they do with their Twitter channels, there appears to be a case for moving some of the social activity resources into a more robust LinkedIn strategy. Bupa placed first in this research report in its combined social reach and activity. Bupa had a very active social program across all 4 of the big social channels (Facebook, Twitter, LinkedIn and YouTube), posting a total of 545 social posts over the 3 month period of the research report for an average of 6 social posts a day split across the 4 big social channels. It placed first in Facebook reach (176,690 followers), first in LinkedIn reach (24,943 followers) and first in both YouTube reach (4,072 subscribers) and activity (80 video posts). 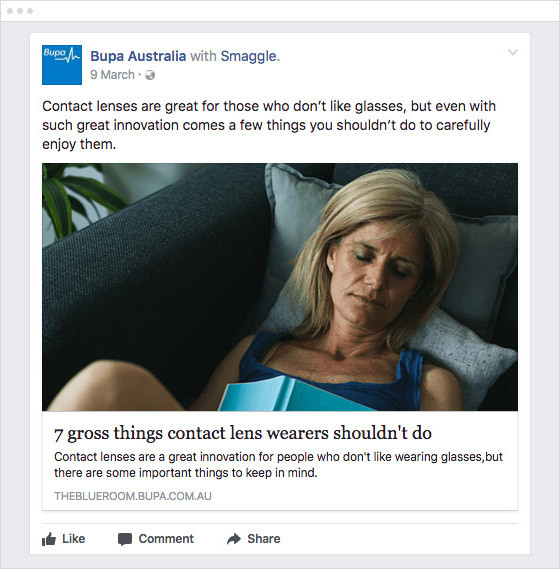 BUPA put most of its content efforts into Content blog links with 101 of its 136 posts (73.54%) during this period of the research report being of this content type. This also amounts to slightly more than 1 content blog link post per day during the 3 month period of the research report. Medibank placed second in this research report. It posted a total of 658 social posts across the 3 month period for an average of about 7 posts per day split across the 4 big social channels. It placed 1st in Facebook activity, 1st in Twitter reach and activity and 1st in LinkedIn activity. 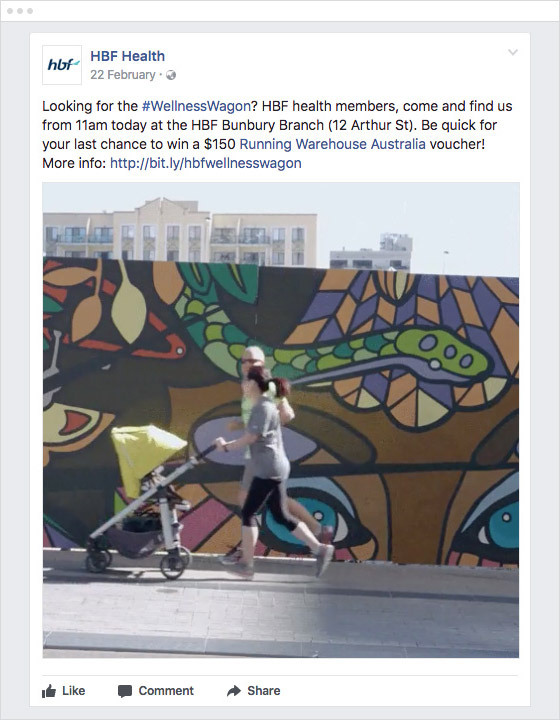 Medibank ranked first for Facebook activity. Posting nearly twice a day on Facebook for the duration of this report. Medibank put most of its content efforts into Content Blog links, General Interest and Sponsorship content. 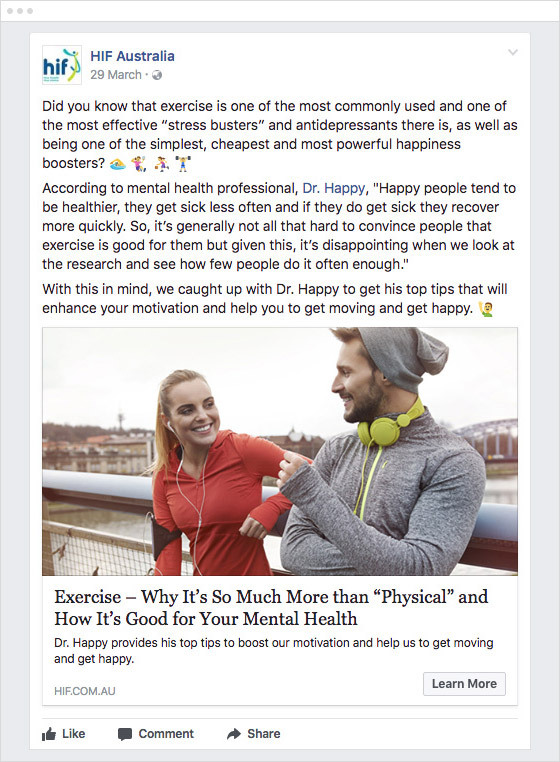 Medibank maintains a very active Facebook channel posting both content links to content blog areas on its website as well as sharing curated content that has appeal to its audience like in the example below. HBF finished third in this research report. It posted a total of 125 social posts across the 3 month period for an average of about 1.5 social posts per day split across the 4 big social channels. It placed 3rd in Twitter reach, 3rd in LinkedIn activity and 3rd in YouTube activity. HBF posted more Competition related posts on Facebook than any of the other health insurers. HBF posted 15 competition related posts, the 2nd most competition posts were posted by Australian Unity who posted 5 competition posts in the same time period. This is an example of one of the HBF’s ‘Competition’ content. Even though the prizes were small for this campaign series, the competitions were centred on smaller towns in Western Australia and played on the audience’s loyalty and pride in their home towns. They were received positively by the Facebook audience. NIB placed fourth in this research report. 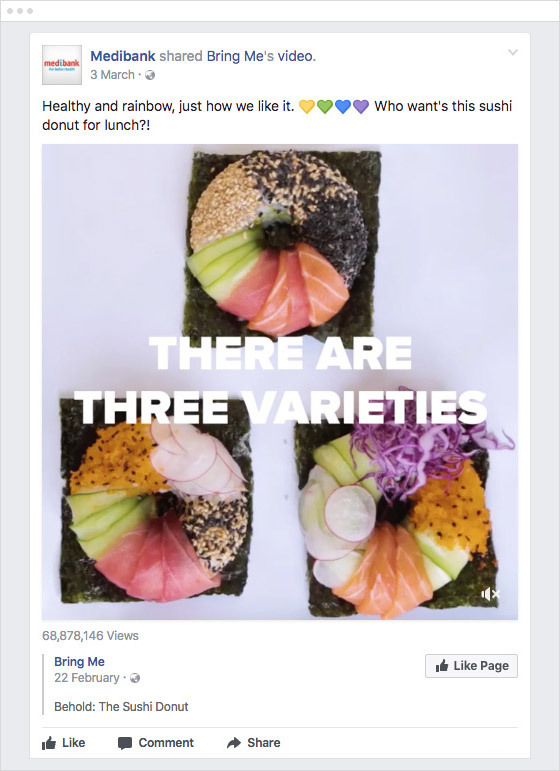 It posted a total of 93 social posts across the 3 month period of the research report for an average of 1 social post per day split across the 4 big social channels. It performed best on LinkedIn, having the 4th best LinkedIn reach (4,284) and 4th most active LinkedIn content (17 posts). NIB put most of its energy into General Interest content. 25% of all the NIB Facebook posts during the 3 month period of the research report was General interest content. This shared curated post received 256 likes, 37 shares and 76 comments. 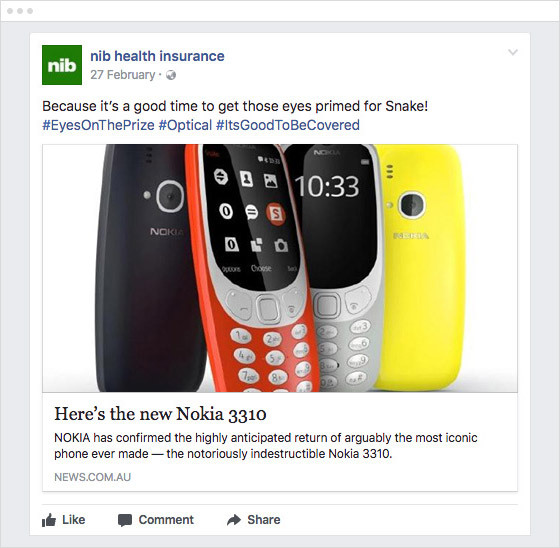 This illustrates that curated content is a valid way for the health insurers to engage with Facebook audiences. HCF finished fifth in this research report. It posted a total of 141 social posts across the 3 month period for an average of 1.5 social posts a day split across the 4 big social channels. It performed best on Twitter, being the 4th most active (111 tweets). HCF posted to Facebook approximately 1.5 times a week and put most of its energy into Content Blog links and General Interest type posts. 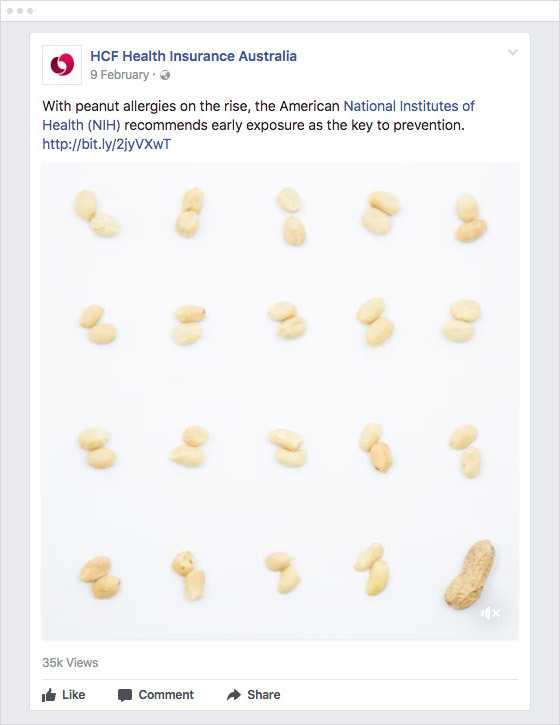 This curated link to an article published by the American National Institutes of Health (NIH) received 35K view and had 30 likes. HIF placed 6th in this research report. It posted a total of 86 social posts across the 3 month period for an average of about 1 social posts per day split across the 4 big social channels. It placed 2nd in Facebook reach. HIF was the fifth most active health insurer on Facebook in this research report. 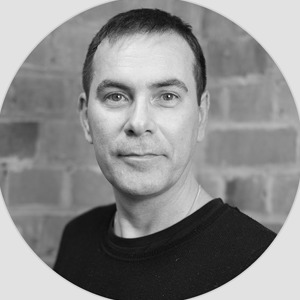 HIF put most of its content efforts into Content Blog link content and was the 3rd most productive for this type of content only behind BUPA and Medibank. 23 of the 38 Facebook posts (60.60%) that HIF posted during the period of this report were content blog links. HIF maintains the ‘HIF Healthy Lifestyle Blog’ as part of its website (http://www.hif.com.au/healthy-lifestyle-blog/default.aspx). Australian Unity placed 7th in this research report. It posted a total of 35 social posts across the 3 month period for an average of about 2 social posts per week split across the 4 big social channels. It placed 3rd in LinkedIn reach and 2nd in YouTube reach. Australian Unity was the ninth most active health insurer on Facebook in the research report. Australian Unity put most of its content efforts into Competitions content. 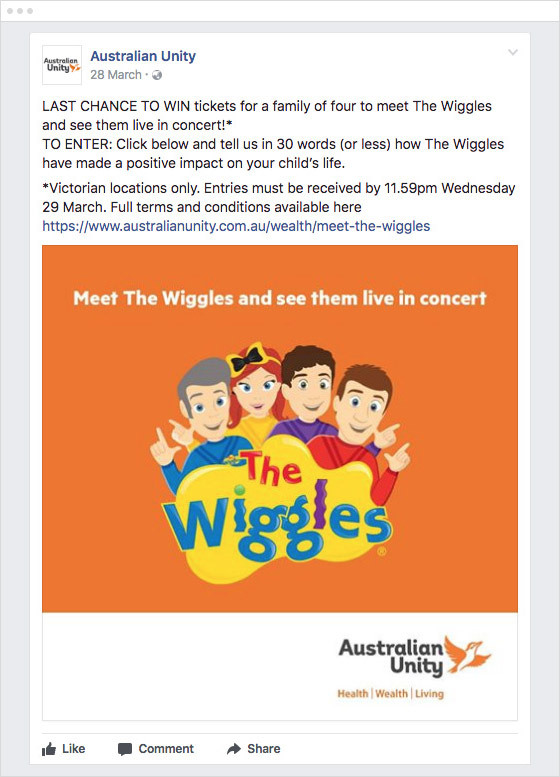 Australian Unity posted 11 times during the period of this report and 5 of these were competition related content. AHM finished 8th in this research report. It posted a total of 73 social posts across the 3 month research period for an average of a little less than 1 social post a day split across the 4 big social channels. It performed best on YouTube, having the 4th best YouTube reach (508 subscribers) and 6th best YouTube activity (6 videos posted). Interestingly even though not being particularly active on Facebook (posting an average of once per week), AHM posted more Customer Service content on Facebook content than any of the other 9 health insurers. 4 of the 13 Facebook posts (31%) that AHM posted during the 3 month period of the research report were customer service related. Customer service is a very relevant content type to be posting on social media so it is a bit surprising that the health insurers haven’t been more active. GMHBA placed 9th in this research report. It posted a total of 191 social posts across the 3 month period for an average of about 2 social posts per day split across the 4 big social channels. It placed 3rd in Twitter activity and 3rd in total social posts. GMHBA ranked third for Facebook activity. Posting 50 Facebook posts over the 3 month period of the report or about 4 times per week. GMHBA put most of its energy into Sponsorship content. 19 of its 50 posts (38%) were sponsorship content related. 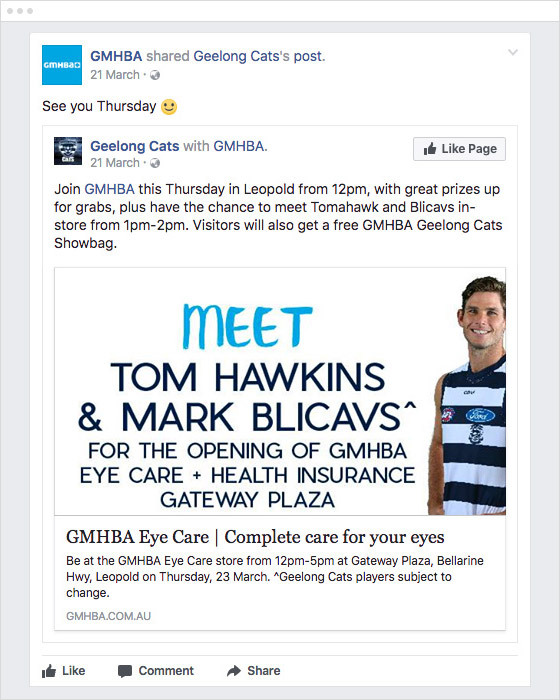 Historically based in Geelong, GMHBA’s sponsorship of the Geelong AFL football team features highly in their Facebook content. Frank finished 10th in this research report. It posted a total of 10 social posts across the 3 month period for an average of a little less than 1 social post per week split across the 4 big social channels. It placed 10th in almost all the reach and activity measurements across all 4 of the big social channels. 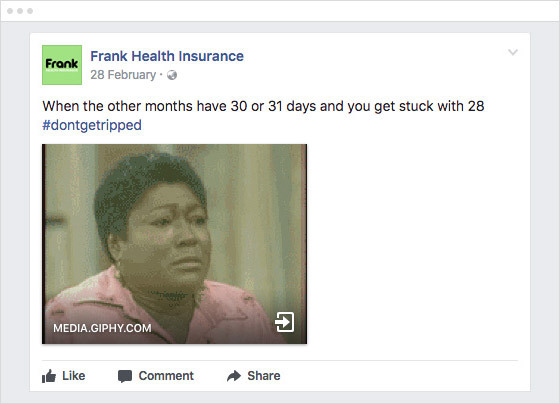 Frank was the least active health insurer on Facebook in this research report. Of the 9 Facebook posts that Frank made during the 3 month period of the report, 7 of them were conversational which probably works well with the tone of voice of the brand. Frank posted a number of humorous posts that used the hashtag #dontgetripped and posted them in a conversational manner.